Stranded spinner dolphin. : Credit: qnr via Flickr. 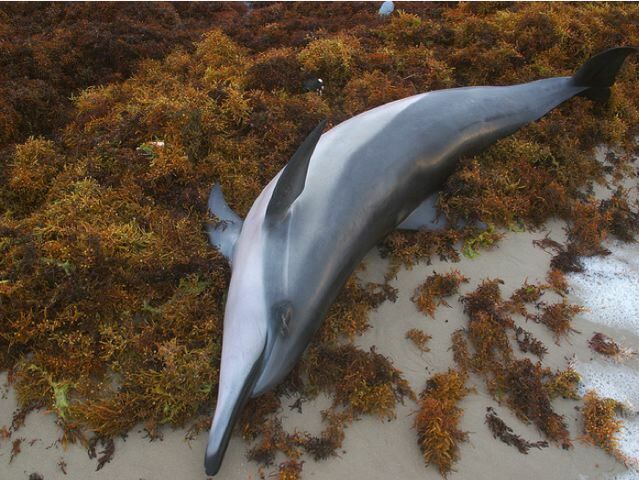 The latest NOAA report on unusual strandings of whales and dolphins in the northern Gulf of Mexico finds they’re still dying at twice the normal rate 18 months after BP’s Deepwater Horizon disaster. 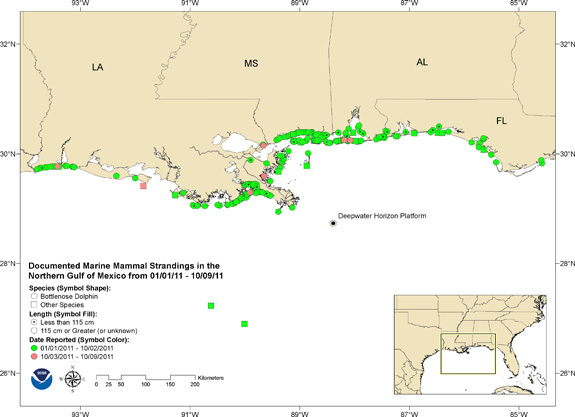 Map of strandings in relation to Deepwater Horizon well. Credit: NOAA. As you can see in the map above, the most heavily oiled shoreline still corresponds with the most dead whales and dolphins. Bottlenose dolphins are shown as circles and other species as squares. Premature, stillborn, or neonatal bottlenose dolphins (with actual or estimated lengths of less than 115 cm/45 inches) are shown as a circle with a black dot inside. Pink points mark the most recent week of data. Green points mark are all other cases since 1 January 2011. All stranded cetaceans (dolphins and whales) from Franklin County, FL to the Texas/ Louisiana border. : Credit: NOAA. 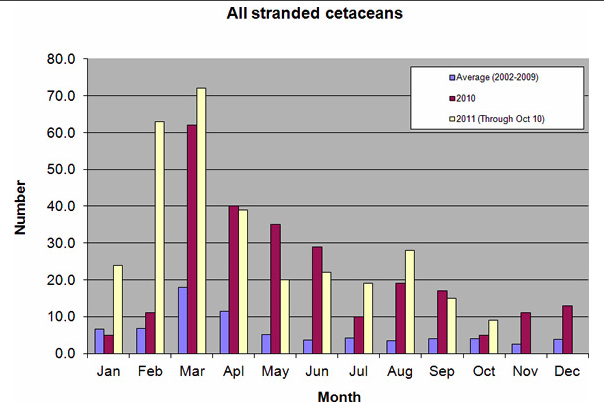 Here you can see how the numbers of strandings have not yet stabilized or even begun to decline. In some cases they’re still growing. The magenta-colored bars mark strandings per month in the year 2010. The ivory-colored bars mark strandings per month so far this year. In my Mother Jones article The BP Cover-Up last year, I wrote about the kind of long-term problems the Gulf might face not just from oil but from extreme quantities of oil in very deep water, as well as from chemical dispersant, including dispersant injected into very deep water. Sadly, it seems that cetaceans—past, present, and future—may be bearing some of those burdens.